This easy recipe using inexpensive meat would be great to have cooking all day long before your New Year's Eve festivities. 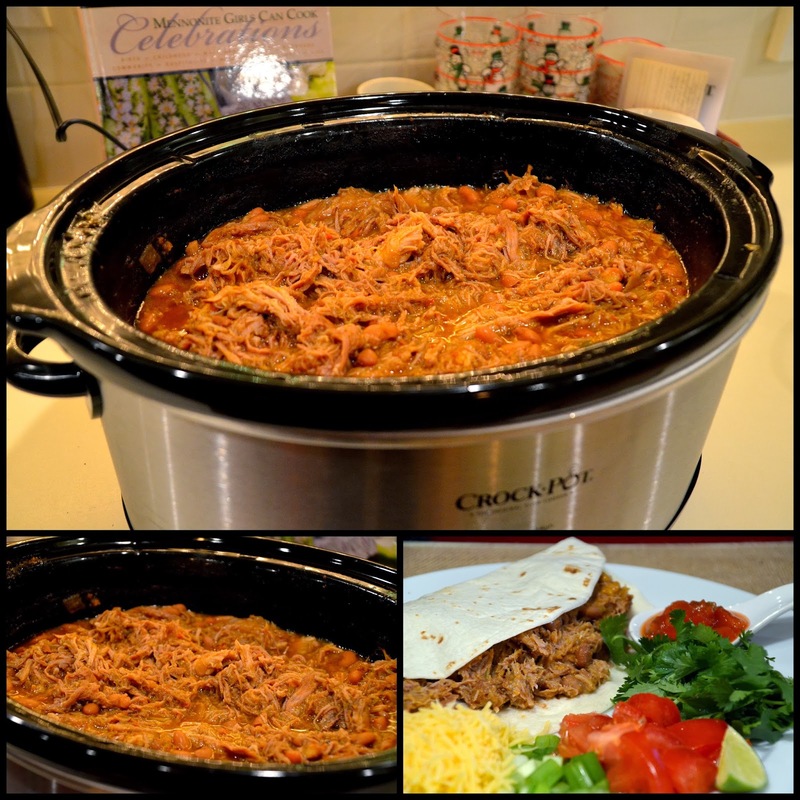 Carnitas is Mexican slow cooked pork that is easily shredded for fillings in soft tacos or burritos or Chimichangas. Put all ingredients in a crock pot and cook on low for 7-8 hours or until beans are soft and meat falls apart. Uncover and cook on high to thicken liquid to desired consistency. At this stage you can skim off any fat if you desire.You can also cook these ingredients in a dutch oven on the stove top for 5 or more hours. Serve with flour or corn tortillas, shredded cheese, cilantro, diced tomatoes, shredded lettuce, green onions, limes, avocado, and salsa. This recipe will serve 8-10 people generously. We are having this for dinner today :) I had a roast pork already cooked and in the freezer so it will be quick and easy fixin's today. My DH was raised in CA and we lived in TX for many years before returning to PA (I know...are you crazy?? haha) so he was raised on this kind of food. I had to learn to like it because I was raised in MI....LOL. I love it now after all these years with him. I think that is a keeper! Thanks. i have just one question...should'nt the beans be put on to soak the night before ? No, the beans don't need pre-soaking using this long cooking method. I finally tried this today and we loved the flavor, the beans were still quite hard after cooking for 9 1/2 hours so next time I will soak them overnight. We love garlic and onions so I put at least twice as much in. Makes a huge pot full.